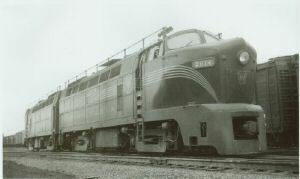 When America's Railroads began the wholesale replacement of steam power after World War II, one of the most lucrative portions of the huge diesel locomotive market was the streamlined, four-axle cab and booster unit for mainline freight operation. 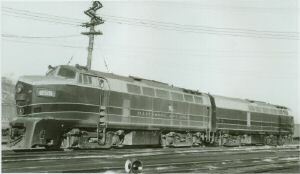 Baldwin Locomotive Company in Philadelphia was not to be left out of this market and in 1948 brought in the Pennsylvania Railroad's favorite industrial designer, Raymond Lowey, to redesign their DR4-4-1500 freight locomotive. 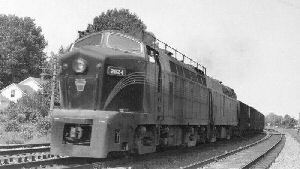 The result was the famous "Shark Nose" freight design that reached it's zenith with the 160 RF-16 cab and booster unit diesels built between 1949 and 1952. Click any thumbnail on this page to see a larger photo. The RF-16's featured the Lowey designed nose and soon became known as "Hauling Fools" by their owners. 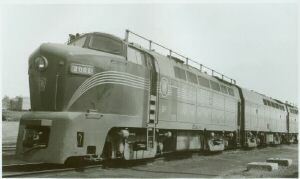 The PRR owned 102 cab and booster units, with B&O and NYC weighing in with 32 and 26 additional combinations respectively. 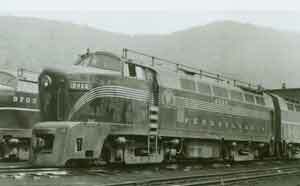 Each was delivered in their owner's best freight schemes, schemes with names like: "Five-stripes", "Lightning Stripes" and "Blue and Gray". Each railroad used their units in all types of freight service, but they were especially popular for hauling heavy trains in difficult terrain and tough conditions. 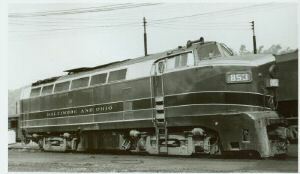 All three owners used their "Sharks" in constant service in New York, Pennsylvania, Ohio and Indiana into the mid-60's. During summers in the late 50's, some NYC Sharks went further west in a lease agreement with the Rock Island for grain service. 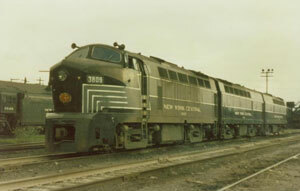 Several of the NYC units refused to become extinct and went on to service on the Monongahela, D&H (in another famous paint scheme! ), Michigan Northern and Escanaba & Lake Superior. The last two Sharks, Baldwin's only surviving streamlined diesels, are in storage today on the E&LS.